alaTest ha raccolto ed analizzato 25 recensioni su Remington F3805. La media della valutazione per questo prodotto è 3.7/5, confrontata con la media della valutazione di 4.3/5 per altri prodotti. Abbiamo analizzato differenti valutazioni di esperti ed utenti, età del prodotto ed altri elementi. A confronto con altri prodotti, Remington F3805 ha ottenuto un alaScore™ complessivo di 85/100 = qualità Molto buono. I had a Remington for years & needed a new one. Just wanted the same as before & got it with this shaver. Great product. I used Argos' click & collect. Great service! Bought for my brother.Good price,does exactly what it's meant to. 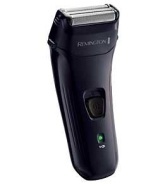 This shaver is excellent value and in my opinion performs just as well as the more expensive models. This product was for first time shaver excellent for this purpose. Excellent item. Yes great value and shaves as good as more expensive models. Works well, not a very close shave but is good and easy to use. Simple design and battery life is good.